Yes, we decided to move forward. The Campaign for the Conservation for Bugoma Forest was launched in 2014 and it brought awareness about the importance of protecting Bugoma forest in particular and forests in general. We have been few people steering the whole process and making sure that our concern was always translated into plans and concrete actions. With one of the worst deforestation rates in the world, with politicians and communities requesting for commercial plantations of eucalyptus and pines (and showing no interest for the reforestation of indigenous trees), with a widespread disregard of any law and legality in regards to the protection of nationally protected forests, with increasing climatic change and worsening habitat disruption, with attacks to Bugoma forests orchestrated by politicians in the aftermath of the general elections of February 2016, in Uganda there is certainly need for people and organizations investing time and commitment for the environment and especially in favour of forest protection. In the occasion of this year 21st March 2016 International Day of Forest, Destination Jungle LTD and Uganda Jungle Lodges LTD decided to move forward and register the Association for the Conservation of Bugoma Forest, a new membership association. The first Annual General Meeting will take place on 13th May and will decide and determine the leadership for the newly born association. All those individuals and organizations who have been supporting the campaign and participating to the cause will have their chance to contribute in a more organized and effective manner. As an association, we will be able to be recognized as stakeholders in the fight for forest protection; we will be able to receive donations from supporters and to initiate project proposals, to mention few points. Therefore, the membership campaign starts immediately until the day of the General meeting. Meantime these are the progress which we have seen by 2016. First of all, eco-tourism activities have started for the first time in Bugoma Forest, thanks to the strong commitment of the leadership of National Forestry Authority in the belief that eco-tourism is a direct, positive contribution in conservation. In February we experienced ourselves a number of nature trails (previously used by the illegal loggers) which are leading to monkeys and chimpanzees habitats. Particularly, we could see a group of Uganda mangabey, which is endemic to this forest. Furthermore, tourists can be protagonists of active reforestation by planting trees in the site allocated for regeneration as a result of the project launched by Run for Nature 2014. This activity sees the engagement of the community through the collaborative management group of Kiangwali. We developed promotional materials for tour operators which were distributed via the Association of Ugandan Tour Operators. The association must keep focusing on the promotion of eco-tourism to make local and international visitors aware and, therefore, bringing tangible changes to Bugoma forest. Exactly what we discussed in theory with the local communities can become a practical and visible change. Here is the source for guides as well as for patrolling teams. Secondly, the “Chimpanzee Go!” initiative is ongoing. 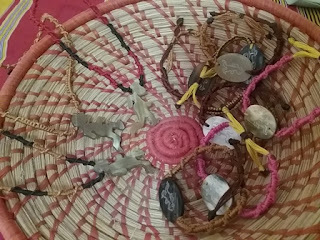 Ugandan artist Zenji Daniel made specifically for the campaign pieces of necklaces and bracelets with the symbols of the chimpanzees. This handicraft is for sale in order to fundraise for the three objectives of the campaign: proceed with the tree-planting in Bugoma; support law enforcement for the protection of the forest (which is facilitating monitoring exercises and the presence of the law); to give incentives to the community organized in the collaborative forest management groups for the purpose of maintaining forested cover in the area and reducing pressure into the protected reserve. Under the initiative, t-shirts were also made portraying the chimpanzees and the campaign logo. 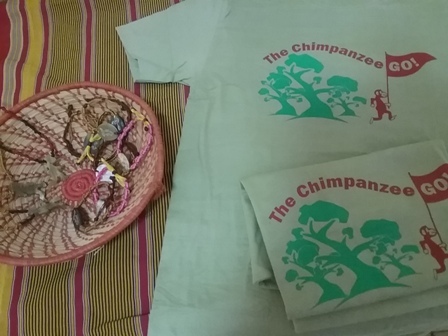 These items so far are displayed in the two lodges of Uganda Jungle Lodges (Ishasha Jungle Lodge and Bwindi Jungle Lodge) and advertised to all the tourists travelling with Destination Jungle LTD. More support is needed. For this year 2016, we welcome the newly born Association for the Conservation of Bugoma Forest.